With two little kids around, you can be sure I've got a lot of messes to clean up & not a lot of time to do it. Reviewing Clean Well Botanical Disinfecting Wipes was kind of a no-brainer. They're much like any other cleaning wipes--they pop out of the container & tear off, pre-moistened to clean non-porous surfaces in your home. What makes The Clean Well Botanical Disinfecting Wipes different from many other cleaning wipes is that the active ingredient that serves to disinfect is 0.05% Thymol, which is a component of Thyme oil. Because it's a natural ingredient & something that we actually eat, the wipes are safe for use of food contact surfaces & children's toys. There is no bleach, no phospates, no fumes & no harmful residue. That's safer for you & your family, but also safer for the environment, as there are no toxic antibacterial ingredients like triclosan, which is often toxic to aquatic algae, fish & wildlife. Overuse of chemicals like this can promote development of bacteria that are resistant to antibiotics, which endangers our health. Clean Well Wipes ingredients list is here. 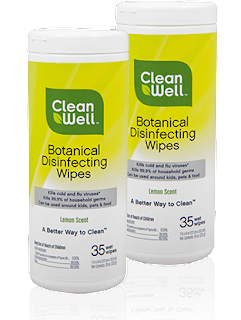 One other thing about Clean Well's wipes is that is just like the competitors, you throw them away afterward. They're not flushable or compostable. That was a bit of a disappointment to me--it seems like if they want to be truly environmentally friendly & not just part-way there, they should make the wipes of a material that's biodegradable & can be composted at home or at least in city composting facilities like Vancouver's Green Waste Bin program. So, the real test of a product is: would I buy them? I really liked the smell--citrus with an undercurrent of thyme--plus I liked the fact that the ingredients list is relatively short & understandable with nothing I'm trying to avoid exposure to. I prefer recyclable or compostable items if I use something disposable, but I might use these sparingly. Disclaimer: I received a free sample of the cleaning wipes to try, but was not otherwise compensated for this post.